Use these simple tips to improve your writing, whether you are writing with less than 140 characters or more than 100,000 words. 01 Read what you've written. When my daughter was in elementary school she would frequently write something and then ask me to review it. When I always asked, "Have you read through it yourself?" her answer was usually, "No." In my estimation, this is not just a problem limited to students still learning how to write and edit: I receive many e-mails where it is clear from either poor phrasing or bad grammar that the author never read the e-mail before sending it. 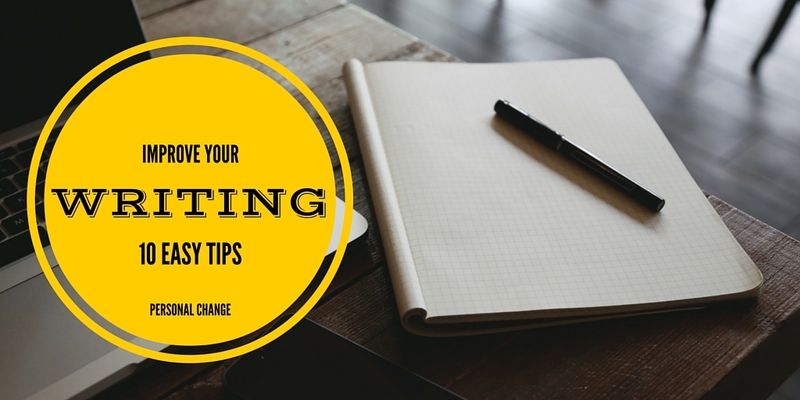 When you write, take a few minutes to read it and make quick corrections. Even when reading back through a document you may not notice misspelled words or grammar problems. Many applications highlight misspelled words. Microsoft Word underlines misspelled words in red and questionable grammar in green. Certainly, not every grammatical improvement that Word suggests is correct, but often it works as the first editor of your writing. 03 Use word count/grade level tools. Word count tools are useful if you set writing goals based on a certain number of words per day. However, word count tools—whether a feature of an application or stand-alone—often include grade level assessments of your writing. This can be helpful to ensure that you are writing at the appropriate level for your desired audience. It is also helpful if you are writing a longer document because you can keep the grade level consistent across various sections or chapters. Word Count Tool is an add-in for Firefox and is also a web-based application. This paragraph (excluding this sentence) has 101 words and 584 characters, including spaces. The reading level is 11-12th grade. 04 Search for your overused words. Whether you call them "overused" or "weasel" words, you probably have certain words that you may use too often without even thinking about it. For me, I use that, also, additionally, so, and thing too often. Whenever I write, I use the Find feature to highlight these words and see if I can eliminate them. Review your writing and try to identify your overused words. It may be helpful to keep this list of words on a piece of paper prominently displayed on your computer. This is probably more of a personal preference than some of these other tips. I find it helpful to print a document when proofreading it, especially if a document is particularly long. Certainly I don't print every e-mail and tweet, but I prefer reading on paper, because it is not as taxing on my eyes as on-screen reading. Printing documents also has the advantages of comparing different versions over time and presenting the writing in a different format so that it can be easier to spot mistakes and opportunities for improvement. 06 Use standard editing markups. If you print a document, learn and use standard proofreading symbols. You can search for lists of these. The basic ones are delete, insert something, close-up a space, bold, italicize, capitalize, and transpose words/letters. 07 Take a break between writing and editing. Spaced repetition is a term used to describe increasing the intervals of time between study periods when reviewing information. Allowing an interval between writing and editing is beneficial because you will be able to view your writing with fresh eyes. I recommend allowing at least a day between writing and reviewing. If you've written a longer document like a book, I recommend waiting at least a week between finishing the writing and starting the editing. 08 Use text to speech. Whenever you view your writing in an unfamiliar way, you will be able to identify problem areas more easily. Just like printing, listening to your written words will present them in a novel way. There are several apps for iPhone and Android to read back selected text. However, at least for iPhone, you can configure the accessibility to speak any selected text. This is my preferred option because it is free. The current version of iOS (version 9) allows you to select from a variety of male and female voices and accents (for English) as well as multiple languages. The iPhone text to speech accessibility option is smart enough to transition between languages. My wife and I tested this with paragraphs of text in Korean and English. Siri had no trouble switching languages. One of the principles in The Elements of Style by William Strunk and EB White is to "omit needless words." When editing your work, look for ways to rephrase so that the same ideas can be stated in fewer words. 10 Adopt a mindful approach to writing. I have frequently read that it is good just write while disregarding spelling, grammar, and sentence construction. While there may be a time for this type of creative writing to generate ideas, I believe it is better to be mindfully aware of spelling and grammar when writing. By keeping these tips and other sources of writing instruction in mind when writing, you can eliminate a lot of errors that would be caught during the first reviewing of a document.